Haingo was born in a tropical downpour. The rising river level isolated the small Malagasy village, defeating Viviaby‘s intention to give birth in the nearest town‘s hospital. She laboured long into the night on a mat on the dirt floor of her home. When her baby finally arrived, the midwife was deeply shocked. Even in the dim lantern light, it was clear that Haingo‘s tiny mouth was slashed by a severe bilateral cleft lip. Viviaby‘s joy turned to sadness for her precious daughter. Her husband immediately rejected their baby. The heart-breaking situation became more dire as the days dragged by. Haingo was unable to successfully breastfeed. She was born with a large cleft in her palate as well which prevented her from sucking and she began to lose weight becoming more and more skinny. The new-born was constantly hungry and cried incessantly – all day and throughout the night. Viviaby was afraid but prayed constantly. Her husband said, “It‘s not going to survive, so you‘d better kill it anyway!” But for Viviaby that was not an option and continued to care for her baby girl as best she could. Viviaby‘s prayers were being answered! The Mercy Ships patient screening in Manakara was announced on the radio and Viviaby left her village to travel there. For two whole days, the tiny, courageous, determined woman carried her baby as she walked through the rugged countryside. The urgency of Haingo‘s case was immediately identified by the screening team. The very next day, Viviaby carried Haingo onto the Mission Aviation Fellowship plane to go to the Africa Mercy, docked on the coast. 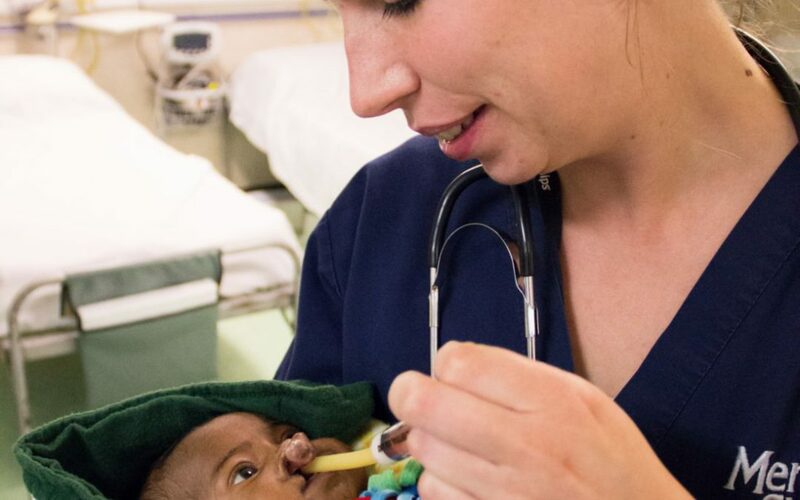 When Haingo was admitted to the Mercy Ships ward, her condition was critical. 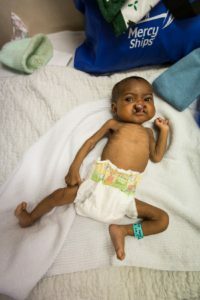 She was seven months old and weighed only 2.2 kilograms – smaller than an average new-born baby. Because Haingo was very malnourished, surgery could not be done straight away. Haingo would have to be on our Infant Feeding Program for quite a while to see if she could gain weight.